Losing weight doesn't need to be complicated. 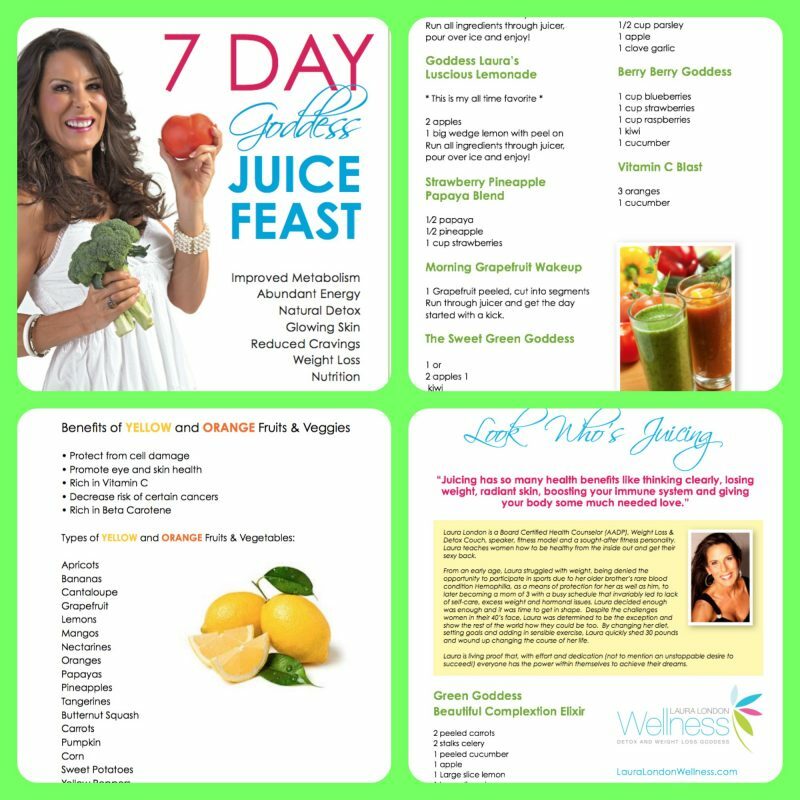 Try my 7 Day Goddess Juice Feast and unleash your inner goddess as you purify, detoxify, and rejuvenate your body and jump start weight loss! You’ll feel and look better. Your energy level will improve, and your skin will look healthier and positively glow. Why Choose the 7 Day Goddess Juice Feast? Hello health and fitness enthusiast! I’m thrilled to have you visiting this website and know that it will change your life forever! You see, I’m a mom of 3, and a devoted wife. I’m just like you-wanting to look and feel my best, but find myself not having the time! So, I started juicing, and boy let me tell you about the benefits! If you are wanting to have improved metabolism, abundant energy, to detox naturally, healthy glowing skin, reduced cravings, weight loss, and nutrition at the cellular level-then KEEP READING! Listen up, I know what you are thinking-its going to be expensive, take forever to see results, and I’ll be starving! Well, I’m here to tell you that you are wrong! My 7 Day Goddess Juice Feast is super easy, way better than paying a doctor’s medical bill, and you will be finally taking your health into your own hands! I am a holistic health coach, certified by the largest nutrition school in the country, Integrative Nutrition, so I know what I’m talking about. My VIP clients have nicknamed me “The Green Fitness Goddess,” for my love and passion for optimal health. So you can trust my word, and my 7 Day Goddess Juice Feast! I’d like to ask you a simple question. You weren’t? Join the club! I know how hard it can be having three kids, a husband who traveled 50% of the time on business, and a daily schedule as busy as the President. I was more than 20 pounds overweight, addicted to sugar, tired and rundown, and my hormones were raging out of control. Sound familiar? I’m not going to lie to you, and try to tell you it was easy. I was out of shape. I was eating whatever I wanted to eat. Hey, I don’t know about you, but I live in the real world where kids and errands get in the way, where you grab fast meals, and you do whatever you need to do to get through the day. So, no, it was not easy. It was very, very hard work. I had to really want to change my exercise routine and my eating habits. As I began to lose weight, I saw my muscle tone develop. Gradually, I became more confident in my appearance, and was proud to show off what was underneath. I played the theme from Rocky on my iPod all the time during my workouts. I kept pushing myself, and gradually transformed my out of shape body into a healthier, fit, and toned one. In 2004, the unforeseen occurred. I experienced a dramatic setback as a result of a severe back injury. Unable to workout without pain, I was doomed. Over the next 7 years, my once fit shape returned to its former out of shape condition. I was turning 42, my eating was once again spiraling out of control, and I was even more out-of-shape and unhappy. Well, that was the same question I asked myself. With tears in my eyes, I stared at my run down body in the mirror, and shouted a loud and defiant “NO!” I wasn’t going to take this lying down. It was time to once again take action for the second time in my life. I had tasted success before, and I would taste it again, and this time nothing was going to stop me from achieving my goal. I started researching different diets, and after dismissing the fads and the complex diets, I was left with basic common sense. Organic fruit and vegetable juice would be come my secret weapon to weight loss. As I learned about the different properties and nutrients of organic fruits and vegetables, the impact they can have on your metabolism and overall health and well being, I began to structure my own 7 Day Goddess Juice Feast. What’s different about my approach? It’s simple. Most diets are about fasting, depriving your body of calories, and eventually wind up making you even hungrier. Try losing weight when you are starving all the time. Your body simply won’t allow it. But my 7-Day Goddess Juice Feast actually purifies, detoxifies, and rejuvenates your body as you lose weight. It actually helps to bring your body back into balance, and restores your energy. Right now I am 45, and absolutely in the very best shape of my life. I’ve not only been able to keep the weight off and restore my competitor’s physique, but I’ve accomplished more this second time around than could ever be imagined. And while exercise helps, my “7-Day Goddess Juice Feast” is at the heart of my healthy way of life. Laura, I was skeptical at first, but I had to give it a try. I have juiced in the past, but your 7-Day Goddess Juice Feast is THE BEST! Because you explained EVERYTHING to me, and made it so clear and easy to implement! Thank you and I can tell all must try this program. Thank you Laura! I now have more energy and feel stronger from the inside out. My skin is clear, and my face has a glow about it. People have even said that I look years younger. I have to thank you Laura for your 7 Day Goddess Juice Feast. My best friend started to have more energy, and prettier flawless skin with boundless energy. 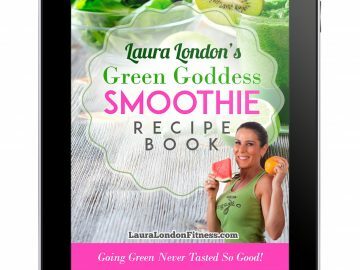 I asked her what she was doing, and she told me about the Laura London 7 Day Goddess Juice Feast. I didn’t even give it a second thought, and I went to buy the book. Now I am enjoying these same benefits. Laura, you are an angel. Thank you! Here are some frequently asked questions that will help you gain clarity and finally make a small investment to reclaim your health! 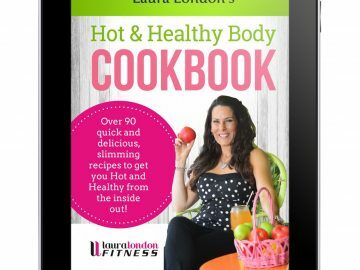 Laura, this sounds great, but after the 7 days, when can you repeat this food plan? Can you do this 7-day juice feast every month? Answer: Great question and YES! You can enjoy my juice feast once a month for optimal health! Or try it with the change of season. Laura, I’m a busy mom and wife-can my husband and kids also enjoy this program? Answer: Yes, both men and woman and children can add fresh juices to their daily diet, but do not need to “FEAST” for 7 days. All family members can enjoy this great gift of health! Laura, I understand the 7 days I juice, but do you also include what to eat after you end the 7-day juice feast? Answer: Great question! Yes, I give you an example of a day of eating before and after ending the feast! I also throw in 2 free smoothie recipes. Just check page 17 when you get your book! Laura! Help! There are SO many juicers on the market! I need to know a juicer you suggest to use! Answer: Don’t worry! I’m going to get you set up for success. I have a page near the end where I go over different types of juicers all listed on page 28! Many people put more time into the maintenance of their cars than their own body. Don’t let this be you. Invest in your appearance and well-being. 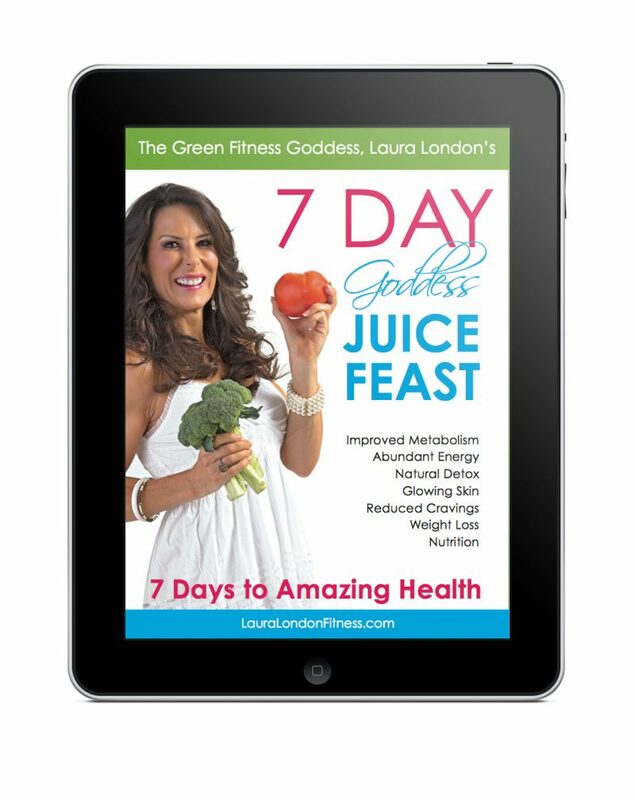 Buy the “7-Day Goddess Juice Feast” and get started feeling better and losing weight today. Your cravings for sweet treats will gradually diminish while you detoxify your body and feed it much needed nutrients and vitamins. Supplements have their place, but nothing takes the place of a steady diet of organic fruit and vegetable juice. Get your copy of the 7 Day Goddess Juice Feast, and you will be able to download it and start reading it even if it’s 2:00 am in the morning. Yes, Laura! I’m a make it happen kind of woman! I’m ready to enjoy life as a goddess, and order your 7 Day Goddess Juice Feast!